Jaipur known as the pink city has a long history of royalty and rich culture, and the royal family still stays here increasing the charm of the city. All heritage sites still pervade around the city, making visit Jaipur a truly memorable experience. The sandstone palaces are situated either on a hilltop, or between valleys, or in the middle of a clear lake, or in the centre of a city, these palaces are treated to your senses and make the major tourist destinations of the city. Hawa Mahal also is known as the Palace of Winds is one of the famous destinations in Jaipur. It was established in 1798 by Maharaja Sawai Pratap Singh and has a five storey exterior and the windows are decorated with intricate latticework which was there for the royal ladies to observe hustle bustle in the city. It is situated in the heart of the city; that makes it necessary to visit. In the middle of Man Sagar lake, it is most delightful Jal Mahal is standing tall. It is a charming and most romantic sight in Jaipur to behold as it floats in the crystal blue lake. An evening walk here is an awe-inspiring experience. The beautiful scene includes the setting sun casts its pale-golden rays at the carving sandstone and shimmering blue waters and variety of birds flock all over the place. This royal Mahal is one of the major sightseeing places to visit to complete your trip. Among the historic palaces in Jaipur, the City Palace has played a greater role in the history of the state. It was established between 1729 and 1732. It is a large palace complex which includes the royal Mubarak Mahal and the Chandra Mahal. The architectural style is a stunning fusion of Rajasthani, Mughal and European form. 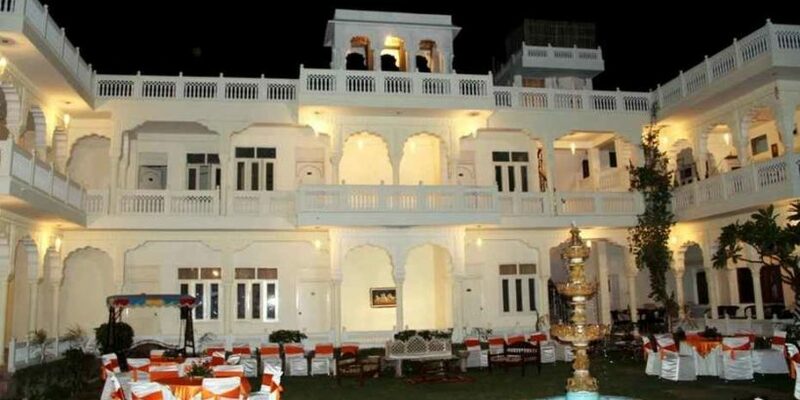 Maharani’s Palace has been changed into a museum which displays weapons, ammunition and a collection of Rajasthani dresses used by the royal family. Thus City Palace is one among the palaces of Jaipur is one of the must-visit palaces of Jaipur due to its rich history and amazing framework. Amber is a fort palace which is situated about 24 km from Jaipur airport. It is built of red sandstone and carved marble. It is known for its picturesque landscape with a combination of Hindu and Mughal styles. The Maota Lake standing in front makes the palace more admirable. It is a legendary display of the lifestyle and culture of the royals of Jaipur. It is an elegant place full of fascinating museums and historical monuments. Nahargarh Fort is located at the range of the Aravalli Hills, creating an appealing view to the city of Jaipur. It was established during the reign of Jai Singh in 1734 and was later expanded in 1868. Nahargarh word literal meaning is the abode of tigers was a fierce barrier, defending Jaipur from their enemies. Within its walls, the fort houses Madhavendra Bhawan was the summer destination for the royal family to spend quality time. Later the palace was built with 12 matching boudoirs for the queens, at the head of which is a suite for the king. They are all connected through corridors graced with delicate murals. The fort provides majestic views to the visitors and shows the glittering view of the city at night. To stay in Jaipur, the pink city has number of hotels within different budget ranges as per the pocket size of the tourists.